Making Smart Decisions to Protect and Improve Your Credit. Bankruptcy’s Influence On Your Credit Score. THE DECISION to file for bankruptcy is not an easy one. A major concern is that your credit will be so damaged that securing a loan, even at a high rate, will be nearly impossible. However, the damage done to your credit is not as bad as it would seem and should be put in perspective. Improving your credit score to the point that it is high enough to be eligible for competitive loan rates is certainly attainable, particularly if you actively engage in strategies that improve your credit score. One reason credit scores do not suffer excessively is because bankruptcy filers very often have poor credit scores to begin with. “In virtually every instance, the consumer will already have repayment problems such as late payments, very high balances, charged-off accounts or collection accounts,” says Rod Griffin, a spokesman for Experian, one of the three major credit bureaus. Some consumers may see a slight boost in their credit scores after filing bankruptcy. This is because the unpaid credit balances are wiped out under the discharge in bankruptcy. High balances are removed, as well late payments and a history of unpaid debts. Both a Chapter 13 and Chapter 7 bankruptcy affect your credit score the same way. Since bankruptcy filers are compared against other bankruptcy filers, credit scores can run the gamut among this group. “In that population, you’ll find some consumers who have very good FICO scores, some who have very bad FICO scores, and in between,” Watts reports. Admittedly, you will not raise your FICO score to a perfect 850 as long as your bankruptcy stays in your report, but with good credit management after filing, a score in the 700s is very much within reach. If your debt is crushing, bankruptcy will give you a much-needed fresh start, and with credit repair strategies, your score should be back between 660 and 720 within a period of time. This is a “good” credit score under the FICO grading system. Rebuilding your credit after bankruptcy is far from being out of the question. In fact, bankruptcy is a first and necessary step to begin rebuilding your credit and your financial health. “Bankruptcy is a very difficult and emotional time, but it also represents a chance to “start over” from a financial sense,” says Bill Harddekopf, CEO at LowCards.com. The road back to financial well-being starts with rebuilding your credit. “One of the first things to do is to get a free copy of your credit report, which you are able to do once a year from each of the three major credit reporting agencies. Check this for errors. Make sure you also determine your FICO credit score and work diligently to build up this score each month,” according to Harddekopf. Raising your score is about returning to basics. Pay your bills on time. Don’t spend more than you can afford. Obtain a credit card that reports to the credit reporting agencies. Pay off the entire balance each month and avoid incurring interest charges. These will all raise your post-bankruptcy credit score. Avoid the urge to steer clear of credit after bankruptcy. Focus on responsibly repaying any loans — such as a car or student loan — that has survived bankruptcy. Pay these on time. Also, you should definitely consider taking out a secured credit card. If you pay it in full each month, it will provide a valuable credit reference. Know your credit score — Many people put this one off, because it can be painful. You know your credit score is low so does it really matter how low? Yes, it does. 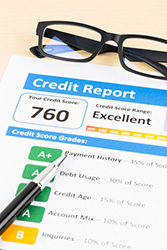 Get a copy of your credit report and know your score. Review it for any inaccuracies and make note of your debts that you will be paying after bankruptcy, such as a car loan or student debt. Then make a plan to pay off those debts and devise a strategy for improving your credit and credit score. WisePiggy.com is a resource to obtain your FICO score for free and without having to enter your credit card number. Open a new bank account — Opening a new checking and savings account will demonstrate financial stability. It can also give you a fresh slate to practice good financial habits. When you open your account, talk to the banker about signing up for automatic online bill pay. This will ensure that your bills are paid on time. Apply for a secured credit card — If big credit card bills led to your bankruptcy, you may feel like this is a terrible idea. Why go down that path again? The best answer is that secured credit cards are one of the easiest ways to build credit and improve credit scores. While you need to compare interest rates of different cards to select a card with the best rate and a low annual fee, you should not lose sight of the importance of paying the balance off in full each month. Get a gas card or a retail card — Gas and retail credit cards will improve your credit. If you drive a car, you will have to purchase gas. Make those gas purchases work for you and an improved credit score. Gas and retail cards typically don’t require applicants to have good credit and, in fact, cater to folks with blemished credit. Pay off your balance in full every month — While re-building your credit, it’s critical to pay off your full balance every month. This demonstrates to creditors that you are not a risk. Timely payments also have a significant impact on your credit score. Continue to monitor your credit score — Check your credit score regularly, monthly is ideal, while you are actively improving your credit. Watching that number go up makes you feel that your hard work is paying off. Be patient, and remember that a bankruptcy remains on your credit report for 10 years, although its impact will lessen relatively soon after the bankruptcy discharge. This is particularly true the more active you are and the sooner you start to rebuild and re-establish your credit. The sooner you act; the sooner you will bounce back with a FICO credit score that is good to excellent. Without the bankruptcy, there is no clean slate or fresh start on which to build your new credit.